We’d love your help. Let us know what’s wrong with this preview of Using HTML 4 (4th Edition) by Lee Anne Phillips. By covering all of the tasks associated with creating a Web page with HTML, Using HTML 4 provides the perfect reference for readers who need quick answers to their HTML questions. The key features of this book are: -Creating The Basic Web Page. -Including Images and Multimedia. -Controlling Presentation. -Adding Interactivity. -Advanced Topics. -HTML Publishing. 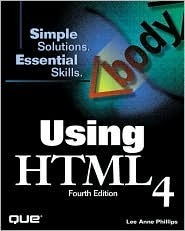 To ask other readers questions about Using HTML 4 (4th Edition), please sign up.